Part 1 Introduction: Fibre structure: Its formation and relation to performance; Spectroscopic characterisation of polymer fibres; X-ray analysis of partial crystalline fibre structure; Analysis of textile fibres using microscopy. Part 2 Manufactured polymer fibres: Structure development in synthetic fibre production; The structure of polyester fibres; Polyamide fiber formation: Structure, properties and characterisation; Synthesis, properties and structure of polylactic acid fibres; The structure of polyolefin fibres; The structure of acrylic, polyvinylalcohol (PVA) and polyvinylchloride (PVC) fibers; The processing, structure and properties of elastomeric fibres; Production and properties of high modulus and high strength polyethylene fibres; Structure and properties of aramid fibres; The structure and properties of high-modulus, high-tenacity VectranTM fibres; The structure of high modulus-high tenacity (poly-p-phenylenebenzobisoxazole) (PBO) fibers; The structure of high-modulus, high-tenacity PIPD ‘M5’ fibre; Electrospinning and its influence on the structure of polymeric nanofibres; Melt spinning and other techniques for the production of nanofibers and microfibers. Due to their complexity and diversity, understanding the structure of textile fibres is of key importance. This authoritative two-volume collection provides a comprehensive review of the structure of an extensive range of textile fibres. Volume 1 begins with an introductory set of chapters on fibre structure and methods to characterise fibres. The second part of the book covers the structure of manufactured polymer fibres such as polyester, polyamides, polyolefin, elastomeric and aramid fibres as well as high-modulus, high-tenacity polymer fibres. Chapters discuss fibre formation during processing and how this affects fibre structure and mechanical properties. A companion volume reviews natural, regenerated, inorganic and specialist fibres. 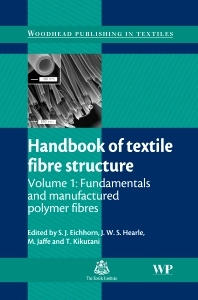 Edited by leading authorities on the subject and with a team of international authors, the two volumes of the Handbook of textile fibre structure is an essential reference for textile technologists, fibre scientists, textile engineers and those in academia. Dr Stephen Eichhorn is Senior Lecturer in Polymer Physics and Biomaterials in the Materials Science Centre at the University of Manchester. He is a member of the ACS Cellulose and Renewable Materials Division and the Institute of Physics. Professor Michael Jaffe was with Celanese and Hoechst Celanese Research in the USA before leaving for the Biomedical Engineering Department at New Jersey Institute of Technology. Dr Takeshi Kikutani is a Professor in the Department of Organic and Polymeric Materials at the Tokyo Institute of Technology. He is a member of the Polymer Processing Society and The Society of Fiber Science and Technology, Japan.